A common practice for many blogs is to use date-based archives for their archive pages. These long lists of links, sorted by month and year, group posts that were made during that period. Although this initially might make sense, it can have an adverse impact on your archive SEO. So how do you optimize your archives for SEO? Does anyone ever visit a website to dig through the archives in search of all posts written in a particular month? Most of the time, a visitor is looking for a post related to a specific topic, tag or category. Sadly, a lot of blogs still only use archives based on dates. To make matters worse, a lot of the time these archives are displayed in the sidebar. This way they show up on every single page. From an SEO perspective, these posts in the archives have no real relation to the other posts except for their publication dates, which doesn’t say much about the content. Remove date archives from your sidebar. Date-based archives aren’t necessarily bad, but you should try not to use them as your main archive. We recommend using something like taxonomies! As indicated, people tend to search for posts based on a particular category, tag or some other taxonomy in your site structure. Using these on your posts has an added advantage that your posts will be less likely to be ignored by people searching for a particular piece of information. This is because people naturally will skip over posts that have a certain age. Why would a post from 2013 still hold relevant information, right? Well, as it turns out, a lot of the time these posts are exactly what the user was looking for. By using category / topic based archives, you enable your visitors to search for these older posts based on relevance and not age, thereby providing your visitor with better information. Don’t underestimate tags: Tag archives also tend to be a popular way of searching through a blog. Properly applying relevant tags can also help your visitors find that nugget of information they’re looking for. Our Yoast SEO plugin contains a few features to assist you with your archives. 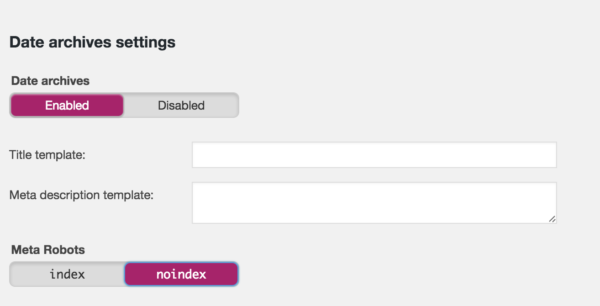 The plugin allows you to either add noindex, follow the archives or to disable them completely. Using the noindex, follow option will allow search engines to follow the links in the archive, but won’t make the date-based archive pages themselves show up in search results. Currently, at Yoast we have date-based archives enabled because we’re in the process of cleaning up old posts. This is one reason why you could consider enabling it in the settings. It’s a good method to use you’re about to do a spring cleanup! Just remember to not link to it from any of your pages. In conclusion, it’s usually a good idea to not use date-based archives as this usually doesn’t help your visitors to find specific posts they’re looking for. If you insist on having a date-based archive present, at least ensure that you apply noindex, nofollow to it, so Google doesn’t index it and consider using taxonomies for your main archive(s).